An Extraordinary Thing Has Happened! An extraordinary thing has been happening at our weekly open meetings. Yes, right here in Montgomery County. Since the runoff, office holders and candidates who have won their primary elections with the assistance of Texas Patriots PAC are attending the meeting and debating spending and the limits of government with each other. The banner on the wall in our meeting room lists our Core Values: Upholding the Constitution, Limited Government, Fiscal Responsibility, and Free Markets. During these remarkable conversations, these actual or likely elected officials are illustrating how these values play out in real situations at their levels of government. Over the last couple of weeks, for instance, spending issues related to the county Certificates of Obligation were actively debated between Woodlands Township board members, a potential county commissioner, a likely Texas House representative, and a Texas Senator. Click HERE to read last weeks blast about this issue. 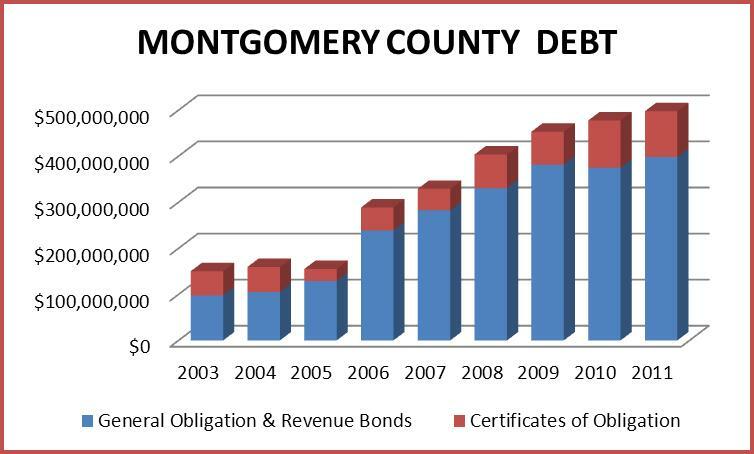 As a result of our group discussion, we've learned 1) that in Montgomery County, there was no direct correlation between debt and population and 2) there is no direct correlation between county government size and population, especially since the county is mandated to take on additional functions as its population reaches certain thresholds. It did seem to many in the room that a 1,152% increase over 15 years versus a population increase of only 196% seemed excessive; and that we need more education about these additional tasks a county is mandated to perform as population grows. Last week, Senator Williams reported at the open meeting that his office was looking into the use of Certificates of Obligation to bypass voters' wishes. We are encouraged by his interest in this issue and appreciate the effort. The weekly meetings have become what we always hoped they'd be - a place for voters to learn about and be involved in decision making for local government. This discussion was made possibly only through the hard work involved in vetting and distributing the voter guide and with your overwhelming support at the polls.